Your convention will take place in a downtown core that currently has over $5 billion in capital investment currently planned or underway. Over 2,000 hotel rooms are within walking distance of the Edmonton Convention Centre, where you’ll find yourself at the heart of Canada’s largest sports and entertainment district with dining, entertainment, shopping, NHL hockey, and concerts. It’s impossible to miss the Edmonton Convention Centre as you approach from the North Saskatchewan River Valley, but the most convenient entrance will depend on how you choose to arrive. The convention centre sits between 97 Street and Jasper Avenue, and Grierson Hill NW, with visitor entrances accessible at both the top and bottom of the hill. Staying at one of Edmonton’s 14 downtown hotels? Take a short stroll through the heart of downtown towards 97 street on Jasper Avenue and use our main entrance. You can’t miss us! The Edmonton Convention Centre embraces Bike Culture and encourages you to cycle through our River Valley and downtown Edmonton. Bike racks have been conveniently placed at the Jasper Avenue/Edmonton Welcome Centre and Assembly Level entrances. There is a bike rack at the bottom of the pedestrian overpass on Grierson Hill. For a full list of cycling routes, view the following maps. The Edmonton International Airport is located on the south side of our city and is conveniently connected to the Edmonton Convention Centre via Highway 2, making arrival by cab or airport shuttle bus (operated by several hotels) easy and efficient. Hundreds of direct flights connect our city to the world. Check out the Interactive Route Map to see if our airport connects directly to your city. With multiple roadways leading to the Edmonton Convention Centre, a designated drop-off zone at the entrance, and plenty of parkades within walking distance (and underground pedway access), arriving by car or cab is a convenient option. Visitors without transportation can contact Edmonton Yellow Cab at 780.462.3456. Edmonton’s Light Rail Transit (LRT) system connects our city, and with underground pedway access to the Edmonton Convention Centre, arriving via public transit (including bus) is made easy and affordable in any number. Plan your trip here. 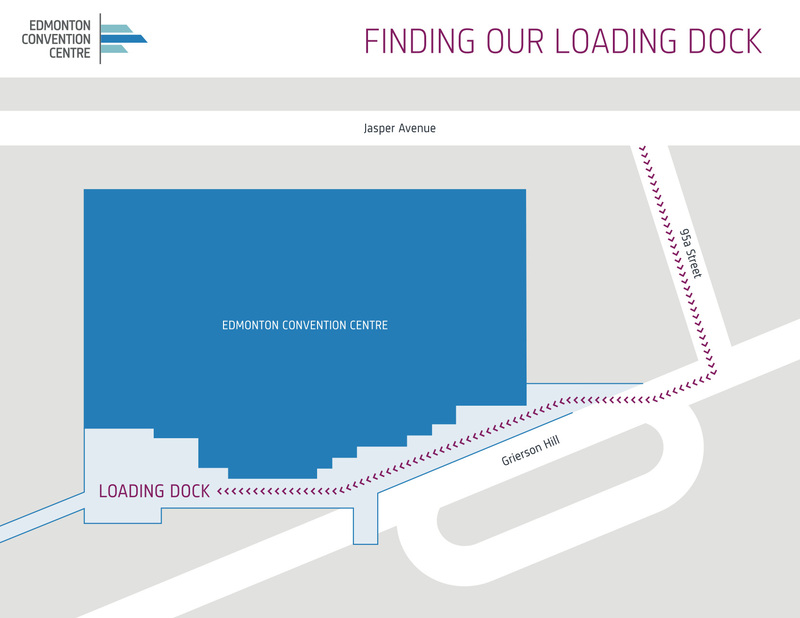 The Edmonton Convention Centre’s loading dock (located on Grierson Hill NW) is capable of receiving large shipments at all hours of operations. Coordination is provided by the convention centre’s dock marshal, equipping our facility to handle trade shows and exhibitions of grand scale.